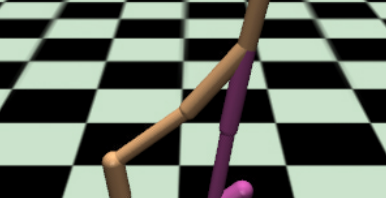 Generative Adversarial Imitation Learning (GAIL)  is a recent successful imitation learning architecture that exploits the adversarial training procedure introduced in Generative Adversarial Networks (GAN) . Albeit successful at generating behaviours similar to those demonstrated to the agent, GAIL suffers from a high sample complexity in the number of interactions it has to carry out in the environment in order to achieve satisfactory performance. We dramatically shrink the amount of interactions with the environment necessary to learn well-behaved imitation policies, by up to several orders of magnitude. Our framework, operating in the model-free regime, exhibits a significant increase in sample-efficiency over previous methods by simultaneously a) learning a self-tuned adversarially-trained surrogate reward and b) leveraging an off-policy actor-critic architecture. We show that our approach is simple to implement and that the learned agents remain remarkably stable, as shown in our experiments that span a variety of continuous control tasks. We address the problem of an agent learning to act in an environment in order to reproduce the behaviour of an expert demonstrator. No direct supervision is provided to the agent (she is never directly told what the optimal action is) nor does she receives a reinforcement signal from the environment upon interaction. Instead, the agent is provided with a pool of trajectories. The approach in this paper, named Sample-efficient Adversarial Mimic (SAM), adopts an off-policy TD learning paradigm. 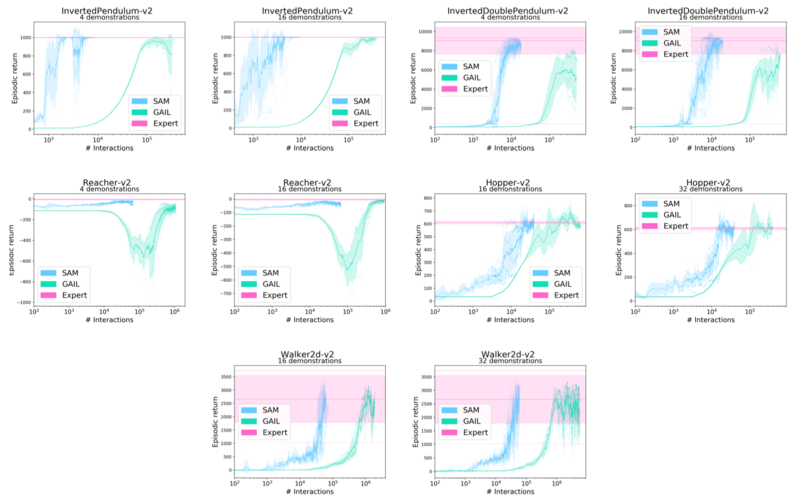 By storing past experiences and replaying them in an uncorrelated fashion, SAM displays significant gains in sample-efficiency. To solve the differentiability bottleneck of  caused by the stochasticity of its generator, we operate over deterministic policies. By relying on an off-policy actor-critic architecture and wielding deterministic policies, SAM builds on the Deep Deterministic Policy Gradients (DDPG) algorithm , in the context of Imitation Learning. Inter-module relationships in different neural architectures (the scope of this figure was inspired from ). Modules with distinct loss functions are depicted with empty circles, while filled circles designate environmental entities. Solid and dotted arrows respectively represent (forward) flow of information and (backward) flow of gradient. a) Generative Adversarial Imitation Learning  b) Actor-Critic architecture  c) SAM (this work). SAM is composed of three interconnected learning modules: a reward module (parameter \(\phi\)), a policy module (parameter \(\theta\)), a critic module (parameter \(\psi\)). 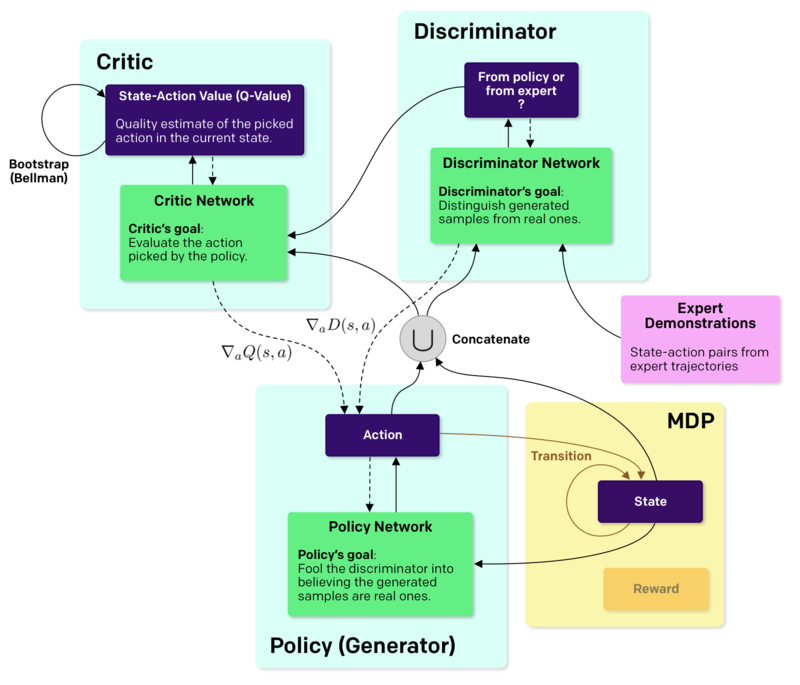 The reward and policy modules are both involved in a GAN's adversarial training procedure, while the policy and critic modules are trained as an actor-critic architecture. As reminded recently in , GANs and actor-critic architectures can be both framed as bilevel optimization problems, each involving two competing components, which we just listed out for both architectures. Interestingly, the policy module plays a role in both problems, tying the two bilevel optimization problems together. In one problem, the policy module is trained against the reward module, while in the other, the policy module is trained against the critic module. 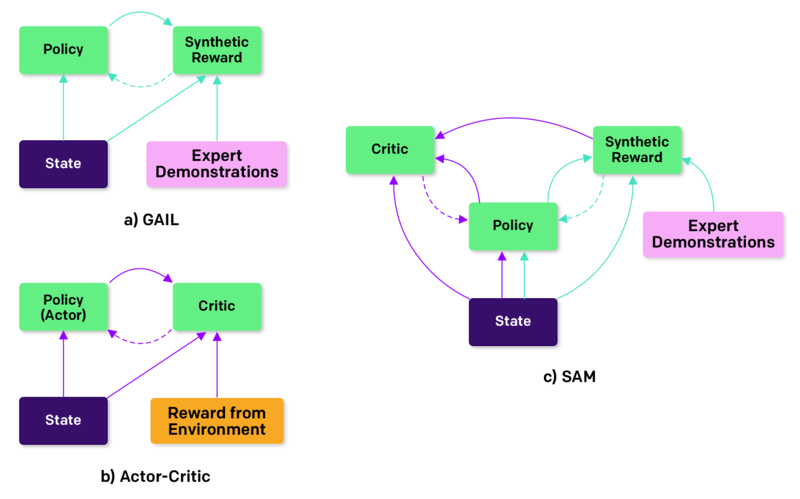 The reward and critic modules can therefore be seen as serving analogous roles in their respective bilevel optimization problems: forging and maintaining a signal which enables the reward-seeking policy to adopt the desired behaviour. How each of these component is optimised is described in the paper. Performance comparison between SAM and GAIL in terms of episodic return. The horizontal axis depicts, in logarithmic scale, the number of interactions with the environment. Ho, Jonathan, and Stefano Ermon. 2016. “Generative Adversarial Imitation Learning.” In Neural Information Processing Systems (NIPS). link. Goodfellow, Ian, Jean Pouget-Abadie, Mehdi Mirza, Bing Xu, David Warde-Farley, Sherjil Ozair, Aaron Courville, and Yoshua Bengio. 2014. “Generative Adversarial Nets.” In Neural Information Processing Systems (NIPS). Pfau, David, and Oriol Vinyals. 2016. “Connecting Generative Adversarial Networks and Actor-Critic Methods.” arXiv [cs.LG]. link. Lillicrap, Timothy P., Jonathan J. Hunt, Alexander Pritzel, Nicolas Heess, Tom Erez, Yuval Tassa, David Silver, and Daan Wierstra. 2016. “Continuous Control with Deep Reinforcement Learning.” In International Conference on Learning Representations (ICLR). link. Sutton, Richard S., David A. McAllester, Satinder P. Singh, and Yishay Mansour. 1999. “Policy Gradient Methods for Reinforcement Learning with Function Approximation.” In Neural Information Processing Systems (NIPS).